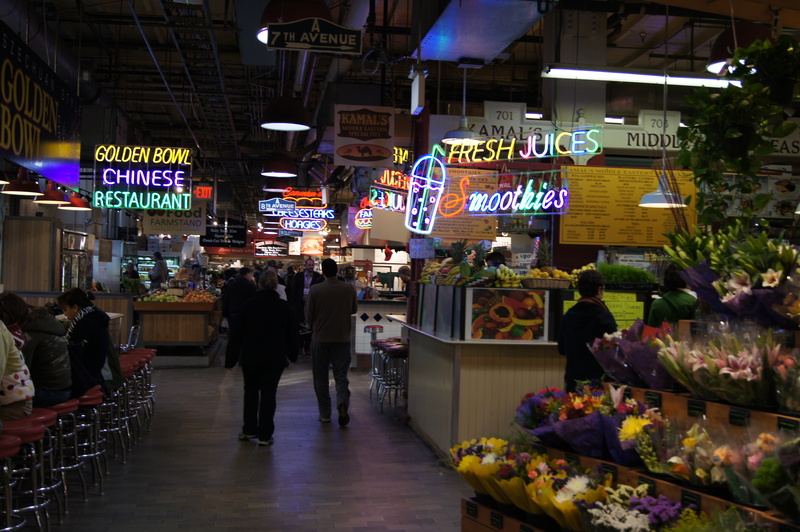 Saturday morning I went with my roommates to check out Philadelphia’s Reading Terminal Market. 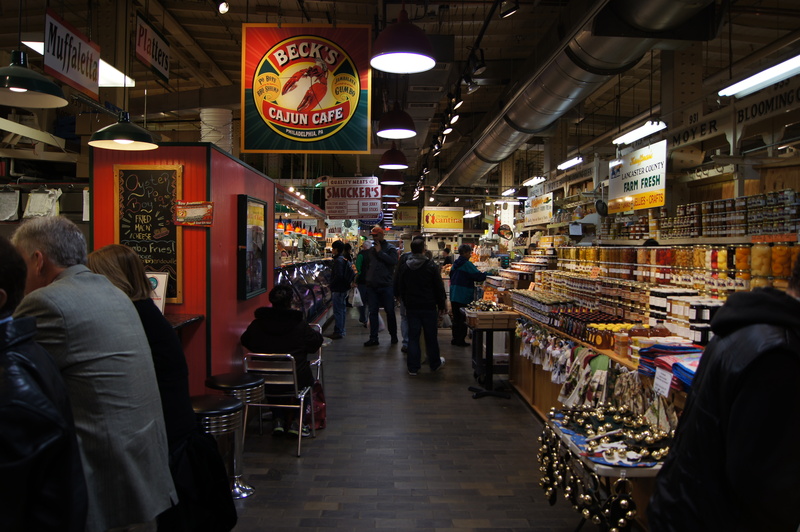 The indoor market has been a part of this city since 1893. Today there are over 80 vendors selling local produce, fresh eggs, milk, meats, seafood, poultry, crafts, jewelry, and handmade goods. The range of items for sale is highly overwhelming. If I had any idea of what I wanted to feast on before I got there, it had entirely vanished as soon as I set foot inside the door. 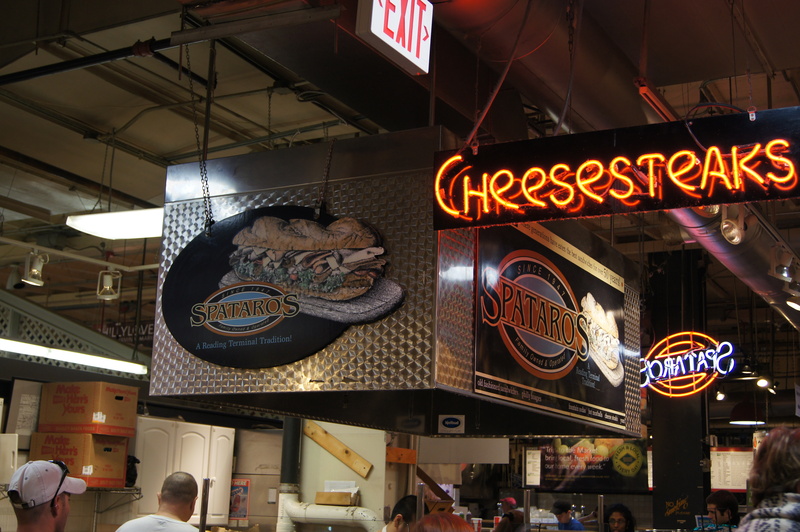 The neon lights, signs hanging from the ceiling, and vast amount of goods for sale completely overwhelmed me. In order to see all that the market had to offer I immediately laid out a game plan in my head. I would walk up and down all the aisles (labeled by adorable little street signs) to weigh my choices before I made any decisions. I passed by produce stands, meat cases, bakeries, restaurants, and stalls run by Amish families who were making breakfast right there on the griddle. All the observing and the growing number of choices just made my decision more difficult. I knew before I went to the market that I wanted to leave with some fresh produce. My produce booth of choice for this trip was the Fair Food Farmstand. 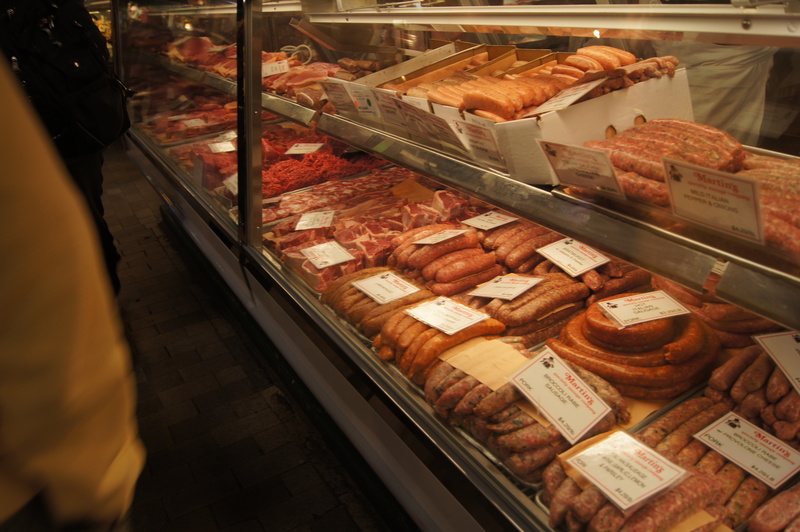 All of the items they sell come from local farms in the Delaware Valley. I purchased some mushrooms, collard greens, sweet potatoes, and the most beautiful looking broccoli I have seen in a long time. Next up was a little something I could snack on as I continued my browsing. Tucked away in one of the corners of the market stands a very unassuming black and white tile store. Don’t be fooled though. The Famous 4th Street Cookie Company has won many awards for their cookies. 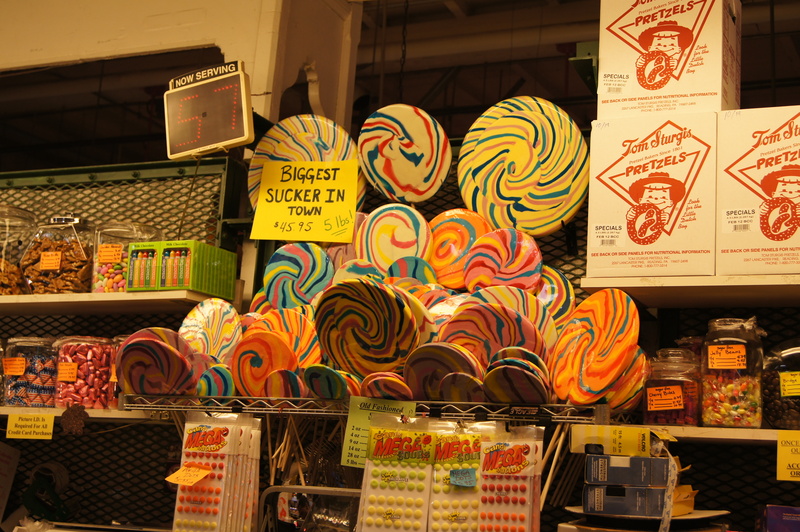 They have no fewer than 12 flavors available for purchase at the market and they all are baked fresh daily. It took me a few minutes to decide which flavor I wanted to sink my teeth into but I finally went with oatmeal raisin. The cookie was soft yet dense, the raisins were still large and plump, and I could taste all of the spices in the batter as well as the pure oatmeal taste. It’s not hard for me to believe they have won awards for those miracles. If you buy a single cookie the price is determined by weight. My cookie was about 3 inches in diameter and cost $2. Just a little hint as to how dense and delicious it was. 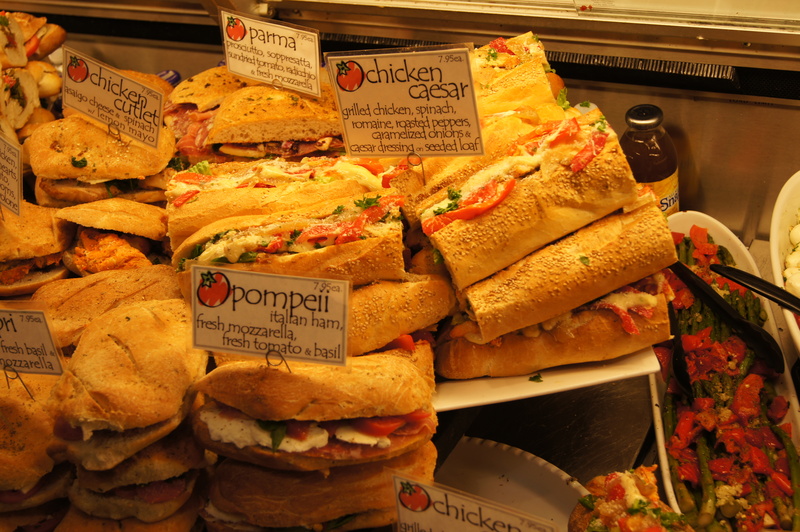 Moving down the “street” from there I was taken aback by the beautiful sight of freshly assembled sandwiches piled in a display case waiting to be consumed. Each sandwich made ‘By George!’ lovingly included several slices of freshly made mozzarella. A definite selling point if you ask me. I am a sucker for cheese. 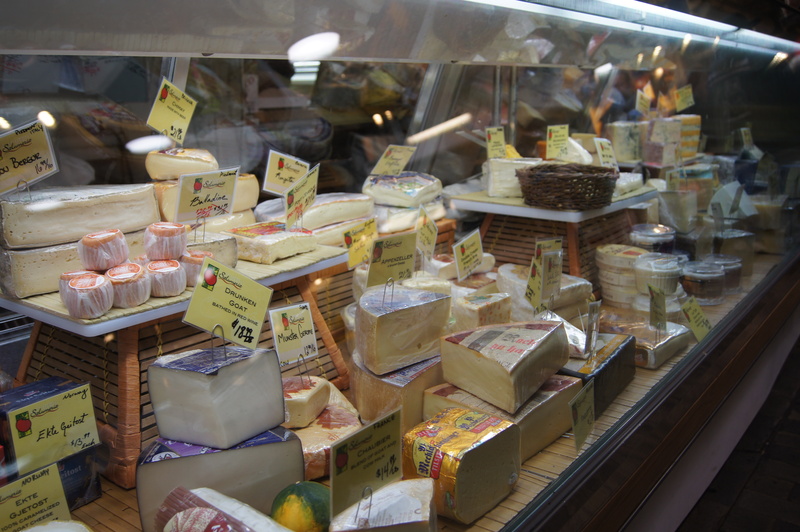 I am already anticipating my return trip to the market to buy some artisan cheese and fresh fish. Yum! The sandwich I chose was called “the euro”. It had mozzarella, tomatoes, basil, roasted red peppers, broccoli rabe, and grilled eggplant all piled into a delicious multi-grain roll. I got it wrapped to take with me for lunch. It was hard to eat the bread and the interior all at once (due to the luscious volume of the bread) but I didn’t mind one bit because all parts of the sandwich were independently spectacular. Particularly the mozzarella. My next Saturday stop was out near Temple University at the Philadelphia Photo Arts Center. Yes, I finally went to a class to help me learn how to properly use my camera. The workshop I signed up for, titled Digital Beginnings, was a very skeletal introduction on how to use a DSLR camera. I learned how the aperture and shutter speed affect the photograph and their relationship with each other. I also got a very brief crash course in how to use Photoshop on raw image files. Sadly, the instructor only wanted us to work with our camera in Program mode. This setting is just one step away from full Auto and is not what I want to be using to take all my pictures. I wanted to play more. Realizing that wasn’t going t be an option in this class I just started playing around myself. I used my new knowledge of the terminology and experimented in the manual mode with different combinations of aperture and shutter speed to get different exposures in my pictures. I still have things to work on of course but I know much more now than I did going into the class. If I play around more on my own hopefully I will keep learning new tricks. I just downloaded a trial of Photoshop Elements so I can start working on my images before I order the program for real (which I intend to do very soon). Once I get them looking fabulous I will share my favorites with you!